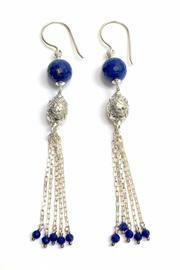 These earrings are made of sterling silver the stones are lapis. They are approximately 3.5 inches long. When wearing these earrings they have great movement and would be a wonderful pair that you can wear both dressed up or relaxing in a pair of jeans!